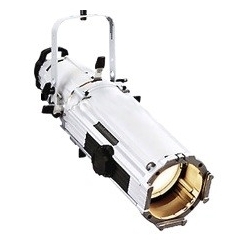 An ellipsoidal, also nicknamed a leko, is one of the most common stage lighting units. The reason it is so common is its ability to be controlled in so many ways. The light begins as a circle of light. By running the barrel (adjusting the lenses in relation to each other) you can achieve a hard or a soft focus. By choosing the right lens configuration, you can set the size of your circle of light at a particular throw distance. In general the further away a light is the larger the circle while using a particular lens degree. A 50 degree lens will give you a larger circle of light than, say, a 19 degree light. Click here to use our throw distance calculator to figure out the best lens degree situation for you. Iris – just in front of the shutters may be a drop in iris slot. It is generally covered with a black piece of metal. You loosen the screws on both sides and then slide it forward. This gives you the ability to then drop an iris into the unit. An iris reduces the size of your circle. Some units have built in irises and others use the drop in iris slot. Choose carefully. Shutters – in the middle of the unit are four shutters. This allows you to shape the light with four straight lines giving you the ability to “cut” light away from an area that you do not want it to have light. Color/ Accessory Slot – In the front of the light are 3 to 4 brackets that can hold a gel frame or other lighting accessories. The gel frame is where you would place your color media like Roscolux to achieve coloring the light. This is also where you would put things like top/ half hats to hide the light beam from the audience. Gobo slot – just behind the top shutter is a slot in which you can slide a gobo/ pattern holder into. This allows you to shape and texture the light by using a gobo. Gobos are metal or glass stencils that block some light and lets other light through. This is how you can project shapes and images with an ellipsoidal. Gobo Rotator – in the same slot that you can drop an iris into you can also drop a gobo rotator in there to rotate your gobos. Some gobo rotators are a “double” gobo rotator which allows for really wonderful movement of light. Not every ellipsoidal has this slot. Choose carefully. 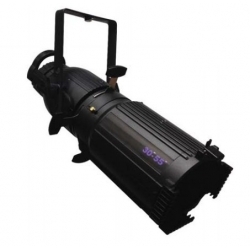 The Chauvet Ovation is a LED Ellipsoidal that produces a white light. It has the shutters, drop in iris/gobo rotator slot, shutters and color/accessory holder. The major benefit to this light is that LED units have an incredibly long lamp life and run very cool. While the initial cost is higher then conventional ellipsoidals the cost of not having to have a dimmer for the unit and the major life time savings of not having to change the lamp is large. Don’t forget that when you change a lamp, not only do you pay for the lamp but also the labor to change it. The unit uses common lens barrels that conventional units like the Source Four and Phoenix use. Click into the unit to read more about the amount of channels it takes and how much control you can have of the dimming curve. Browse our selection of LED ellipsoidals. 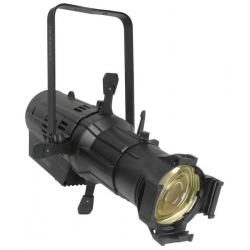 The Altman Phoenix is a great conventional ellipsoidal. It can be lamped at 575 & 750 watts. It has the shutters, drop in iris/gobo rotator slot, shutters and color/accessory holder. The major benefit to this light is that it has an affordable price point with all of the features of traditional ellipsoidals. The Phoenix, unique to itself does also have lockable shutters and a light leak preventing accessory holder. If you can not afford LED Ellipsoidals it is an excellent choice. Click into the Altman Phoenix to read more details about it and its specifications. Browse our selection of fixed degree ellipsoidals. The Altman 3.5Q is a cute unit for a low ceiling height. It does have shutters, gobo slot and color frame holder. Its max wattage is 500 watts. Click on the unit to view the different lens configurations and lamp choices. The ETC Source Four is probably the most common ellipsoidal used today. Like the Phoenix it does have the gobo slot, shutters, drop in iris slot and color / accessory holders. It may be lamped at 375, 575 and 750 watts. It is a great light with many different lens options. The barrel does rotate. The shutters are not lockable. Browse our selection of ETC Source Four units. 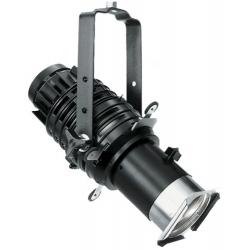 The ETC Source Four Jr. is a smaller sized Source Four that is still a powerful light for smaller spaces. It can be lamped at 375 & 575 Watts. It does have the shutters, a gobo slot, a drop in iris slot and accessory holders in the front. The barrel does not rotate but the pattern holder has some adjustment possibilities that help make lining up a gobo easier. Browse our selection of ETC Source Four Jr. units. The ETC Source Four Zoom is incredibly useful when you are not in a situation where the size circle of light is always going to be the same. It gives you ranges of being able to change the size of the circle by not changing lens tubes but by simply changing the relationship of the lenses in side the unit. The positive side is, it is a lot more adjustable. The down side is the price point is a little higher and the unit is heavier. Many of the ellipsoidals have zoom options. Click on the browse our selection below to see more of them. As most ellipsoidals it also has the shutters, gobo slot, iris slot and accessory holder in front. Browse our selection of zoom ellipsoidals. The ETC Source Four Mini is a really small but really cute ellipsoidal. Magnificent for art work and high lighting in very tight situations. Look at the picture and the persons hand. That really gives you a great feel for how small this unit really is. It is very common to get the accessories that let you hang this off of architectural lighting track making it amazing for gallery situations. It uses a MR 16 lamp and is much lower wattage then traditional ellipsoidals. Great for the power draw but not as bright as something like a Source Four Jr. However, in the situations where you would use this light you generally would not desire something that bright. Click on the unit to read more about its specifications. Browse our selection of miniature ellipsoidals.